John Kamin served two tours in Iraq, the first from 2007 to 2008. 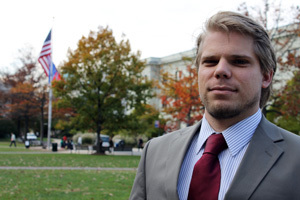 Before winter break of his first term at AU in 2009, Kamin received a letter calling him back to service and withdrawing him from the university for a year. Since that letter, life has been moving at a demanding pace for him. He took off his uniform on December 20, 2010, and was in DC three days later, giving a presentation on returning veteran needs at AU’s annual Ann Ferrin Teaching Conference – just a handful of days removed from active service. Kamin returned to American that year with a renewed focus on his education. While it was a difficult transition – one that kept his senses in a combat zone instead of on campus – living up to the mission is exactly what Kamin has done with his time at AU. A native of New York’s Upper West Side, the School of Public Affairs CLEG (Communications, Legal Institutions, Economics, and Government) major transferred to AU because of the level of involvement and activism he noticed in the student body. Returning from military life, staying active was important for Kamin, who enjoys playing music and rapping in his limited free time. More important, however, was finding the camaraderie he felt in the armed services. That sense of purpose led him to join AU Vets and become increasingly involved in the campus group, which includes eight club officers, about twenty-five active members, and a large listserv. Now, after less than a year in the organization, Kamin holds the post of president during a time when AU has gained notoriety as a military friendly school. This isn’t his first and only position in veterans affairs, though. He serves as a spokesman for Iraq and Afghanistan Veterans of America (IAVA), raising awareness on veteran unemployment. Both his work with IAVA and love of rapping landed him national attention through an interview on TIME.com. Kamin was even a legislative summer intern this year with hopes of drawing attention to veterans needs. Without a doubt, veterans issues are Kamin’s passion. It’s something the Delta Phi Epsilon brother admits he has to watch himself on. While he’s committed to his studies, veterans matters stick close to his heart. “Between school work and working on veterans stuff, I’ve got to check myself because I’ll take veterans stuff ninety percent of the time,” he shares. AU Vets has worked hard to spread the word on veterans’ issues. At the start of the semester, Kamin and fifteen other vets visited freshman English classes – twenty-five to be exact – in order to present and answer questions revolving around the book The Good Soldier, one journalist’s account of his time attached to a unit during the surge in Baghdad. For Veterans Day, Kamin and AU Vets planned a reception to bring the student veteran community together. Throughout the week, they held care package drives, film screenings, and a Military 101 class to educate students on how the military works. For Kamin, the veteran community at AU has been a saving grace, and he’s doing his best to give back what it’s given him. Seeing the point where he stands now – president of a group that represents his passion and a college senior approaching graduation – he thinks back to how he felt returning from Iraq and how far he’s come. To hear John speak about veteran unemployment on the White House's YouTube channel, click here. Follow AU Vets on Twitter here: @auvets.